Editor's note: Our guest blogger is Andrei Zimiles, Co-founder and CEO of the vertical healthcare network Doctor.com. See what other organizations that have gone Google have to say. Choosing a doctor can be difficult. Many of us turn to peer recommendations and word-of-mouth reviews when selecting a physician, but credible reviews are few and far between. At Doctor.com, our mission is to connect the millions of patients in America with the right healthcare providers. Our core business is an online directory platform with detailed profiles of more than two million licensed healthcare practitioners in America. Visitors to our site can search for doctors by location, insurance plan, languages spoken, gender and other criteria. This January, we began deploying an application to efficiently collect credible patient reviews of their doctors, which we publish at Doctor.com and across a growing network of top healthcare websites such as the recently launched YourDoctor.com, a joint venture with Healthline, one of the web’s most popular destinations for healthcare information and tools. Chromebooks are allowing us to scale this program quickly and efficiently. 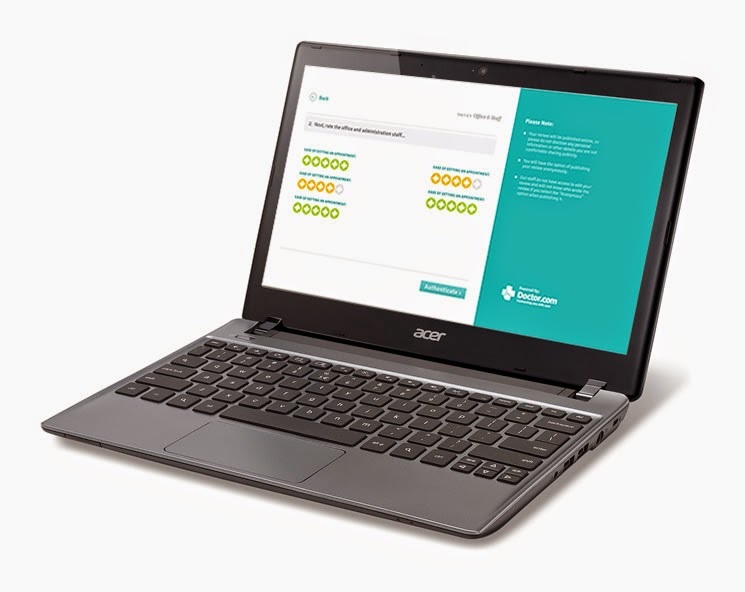 We send every doctor who opts in an Acer Chromebook, which typically sits at the receptionist counter. At checkout, patients are encouraged to spend a few minutes entering anonymous feedback about their doctor as they wait for their paperwork to go through. This feedback is immediately sent to our team, and we vet and publish reviews on the Doctor.com network according to strict guidelines. This combination of credible reviews from patients and a wide network of important healthcare sites is unique in the marketplace and a win-win for both our doctor and patient users. A review system is only useful when it’s robust, scalable and incorporates the feedback of many patients. The speed and simplicity of Chromebooks makes them easy to work into the offices’ existing workflow. We could have used any number of devices, but Chromebooks were, by far, the most cost-efficient, patient-friendly and secure devices out there. With the Acer Chromebook, we are able to deploy the device cost-effectively and can pass that savings along to the doctors we work with. From a security and IT perspective, our deployment team has enjoyed working with the Chromebook as a technology platform, particularly with the extra features made possible via Google’s Management Console. Initial set-up is very efficient both in the pre-staging at our offices and once deployed to the doctor’s offices. Out of all the Chromebooks that we have deployed we have not had any issues and we are seeing fantastic engagement from patients that are using them. At Doctor.com we believe in improving the way patients and doctors connect through the use of disruptive technologies. The real-time feedback made possible by the Chromebook platform is a great example of this. We are simultaneously helping doctors understand how to improve the care they provide and helping patients make more informed decisions about which doctors will be best suited to their needs. We are pleased to be partnered with Google on this exciting project and look forward to exploring further innovations using the Chrome OS and Chromebook platform in the future.